It is said that a man who is jack of all trades is master of none, but I guess the time has proved it wrong, if you are good at multiple things it shows your potential and your desire to attain more. Artists can never remain mute, immobile and inactive in their workplaces because there is too much to perform that they hardly find time out to stand and stare. If you are good at multiple genres of your field, there are positive chances on your part to meet a desirable end, a designer who is good at typography, mockups, branding, logos and more is preferred over the one who is good and capable of one genre at a time. Because there is a variety of tasks to do on the office desk and if you fail to do what is demanded of you then probably you are pushed out of your comfort zone soon. To err is human but learning from one’s errors and improving oneself is maturity. Our profession too demands such sort of ripeness from us that we take criticism positively and we shall perform accordingly without taking pressure on head. 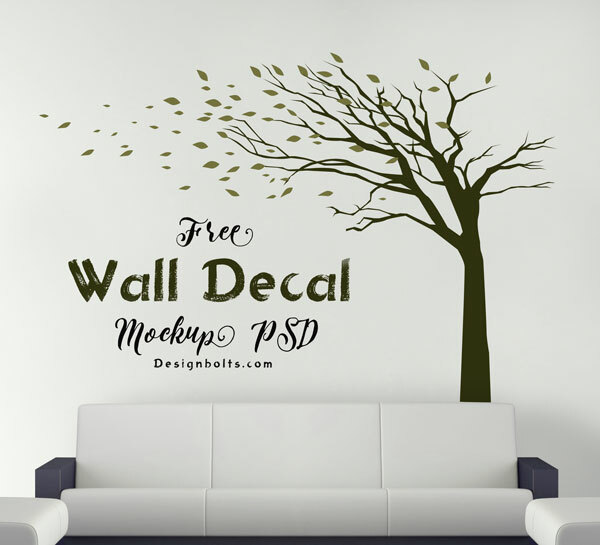 Well today I am unfolding Free vinyl sticker / wall decal mockup PSD that I made to benefit all those designers who want to showcase their wall decals on a website or publically/commercially. People love having wall decals for their offices and houses etc. they shop for it online and also get it from markets. People now have exposure to keep a reality check that what is in fashion and what is out of fashion. You can simply insert in your own design of wall decal into this mockup and feel free to manifest it like you want. Isn’t it easy for you? Do give us your feedback and make us know what you think about our freebies. Subscribe us for more because a lot more is already lined up to fall into your feet. I am sure you are keeping pace with our day to day posts of art and designs. Stay hooked and we won’t let you down. Another nice mock-up! All of your things are very nice! I sure thank you!